For Rogers, farming is a calling and a way of life. He says continuing financial pressure is threatening the survival of dairy farmers and the landscape of New England. 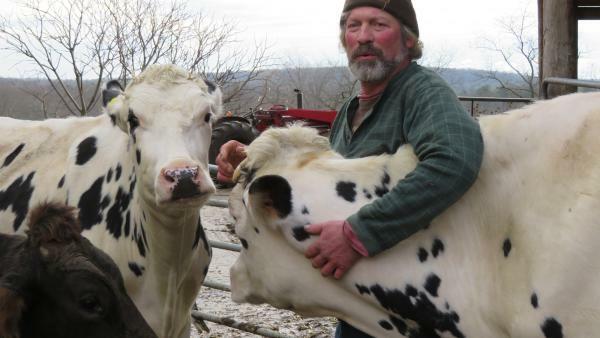 Farmer Will Rogers says he can no longer make ends meet milking the 75 cows on his dairy farm in Warren, Mass. Declining milk prices are taking a financial and emotional toll on dairy farmers, he says. 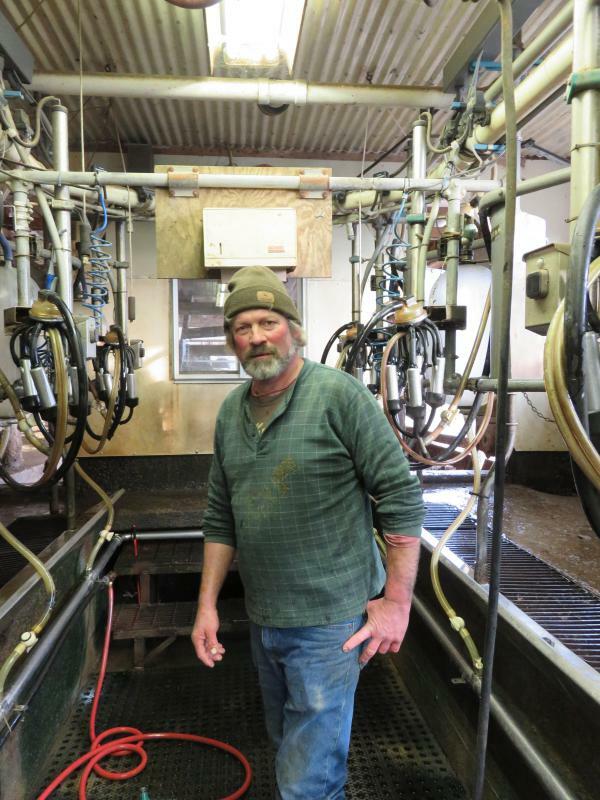 Rogers says dairy farming is "all I ever wanted to do," but he doesn't know how much longer he can keep his farm going. Milk prices have dropped so low, he's getting paid only about 75 percent of his production costs. As the nation's dairy farmers struggle through their fourth year of depressed milk prices, concerns are rising that many are becoming depressed themselves. The outlook for the next year is so bleak, it's heightening worries — especially in the Northeast — about farmer suicides. Agri-Mark Inc., a dairy cooperative with about 1,000 members, saw three farmers take their own lives in the past three years. The most recent was last month. It's a very small sample, but very sharp and disturbing increase. 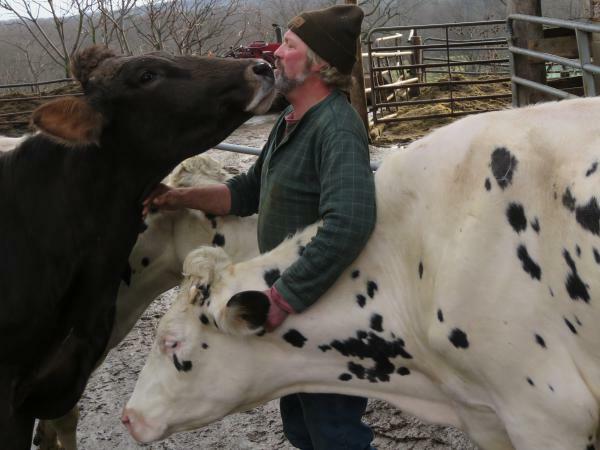 "It's tough to keep your head up with all of what's going on," says 55-year-old Will Rogers, a ruddy-faced white-haired farmer who has 75 cows on his farm in Warren, Mass. Out in his barn milking cows at the crack of dawn, as he does every single day, Rogers says farming is his calling, just as it was for his father. It's hard to reconcile such a wholesome way of life, he says, with farmers taking their own lives. "What [we] do here, this is nature's way, God's way," he says. "This is life, this sustains life." But it's increasingly hard to make a living. Rogers says the price he's getting for milk these days is what he made several decades ago. It's about 75 percent of what he needs just to break even. And the stress is only mounting as milk prices continue to fall, due to a global oversupply of milk, and lower prices overseas. "I don't see any relief in sight," Rogers says with a sigh. Knowing farmers' despair, Agri-Mark wanted to help. The Co-op pays its member farmers for their milk, which goes into its own brands of Cabot and McCadam cheeses, as well as others. When it came time to mail farmers their milk check this month, Agri-Mark also included a chart showing the dismal 2018 milk prices forecast, and a list of suicide prevention hotlines. "I personally just felt my heart sank," Rogers says. "It created a lot of distress." Especially since his own father committed suicide 30 years ago, during another down-cycle for farmers. "It released a lot of emotion that took me years to deal with," he adds. "When I opened that letter, everything came flooding back to me." While he believes the letter was well-intentioned, Rogers says it was so brusque and so grim – without even a shred of hope to hang on — he fears it could hurt more than it helps. "It's almost like a self-fulfilling prophesy," he says. "It could throw [some farmers] over the edge. It was so 'doom and gloom,' [farmers] might think 'I might as well just check out, there's no point going on.'" Rogers says the letter could have struck a more hopeful note, for example, by updating farmers on legislative efforts to get a more favorable 2018 Farm Bill passed by Congress. Or he says, it could have noted prospects of improving the "safety-net" insurance program for farmers, which as it turns out, was signed into law days later as part of the most recent federal budget deal. And Rogers says, instead of sending a cold letter, Agri-Mark could have sent a field rep in person, or could have checked in by phone. Agri-Mark acknowledges its letter was blunt, but Blake Gendebien, a farmer and member of the Board of Directors, says, it was meant to get farmers' attention, as quickly as possible. "We knew there was no great way to do it," Gendebien says. But "we decided a letter with the check would be best, because everyone opens a letter with their milk check." He calls it "courageous" that Agri-Mark addressed the issue head on, and "ran away from the stigma that mental health is something that we should all hide in our closets." Daniel J. Reidenberg, managing director of the National Council for Suicide Prevention, agrees. As disturbing as it may be, he says, talking about suicide does help more than it hurts. And Riedenberg says Agri-Mark was right to reach out. "I'm not saying that their approach was the best approach or was worded in exactly the right way," Reidenberg says. "But the idea that they wanted to do the right thing and try to save people and literally save their lives was a remarkable effort. We need to do everything that we can before it's too late." According to the Centers for Disease Control and Prevention, farmers, as a group, have a higher suicide rate than any other occupation, even twice as high as vets. Experts say farmers face a kind of "perfect storm" of financial pressure and a sense of powerlessness in an industry where prices are set by the government, combined with social isolation, and a self-reliant spirit that may make them loathe to seek help. Farmers are taught to "cowboy up, tough it out, be a man," says Robert Fetsch, who's studied farmers and ranchers at Colorado State University. "Many are scripted to be afraid to reach out for help, and afraid to say 'I'm hurting.'" Gendebien says farmers also bear the weight of their family legacy. "They're feeling 'my grandfather was able to be successful, my father was able to be successful, and look at me, I can't do it,"" Gendebien says. "It's too much to bear." On top of all that is what clinical psychologist and Iowa farmer Michael R. Rosmann calls the "agrarian imperative." Many farmers do what they do because of a "deep urge ... a calling to produce the essentials for life that the human species need," he says. While others might have considered career changes, he says farmers persevere in the face of overwhelming obstacles, and end up feeling hopeless. But Rosmann says, in this unusually protracted down-cycle, he sees signs that farmers are more willing to reach out for help, as he's been getting several calls a week from farmers seeking assistance. "There was a time when people wouldn't reach out nearly as much as they do now," he says. "It's changing." Next month, Agri-Mark says it'll start offering free counseling to farmers, and will continue their suicide awareness and prevention efforts. It's not just individual farmers lives at stake, but also New England's landscape and character. The 850 farms that dotted the state of Massachusetts 30 years ago, have now dwindled down to under a hundred, says Agri-Mark spokesman Douglas DiMento. "I used to work for the biggest dairy farmer in the state in Georgetown, Massachusetts," DiMento says. "That's now the Georgetown Country Club. And you see that taking place throughout southern New England, where land values [and labor and energy costs] are high. Why milk cows if you can sell your land and make millions?" For his part, farmer Will Rogers says he's not sure how much longer he'll be able to keep his farm going. In order to stay afloat, he's started to diversify, selling hay, firewood, cornstalks, pumpkins, sweetcorn, raw milk, and a little bit of beef, along with his milk. "It takes all the berries to fill the basket," he says. "But I'm still short a few berries. How much can one man do?" But Rogers can't fathom doing anything else. "This isn't a job. It's a way of life, and what I was put on this planet to do," he says. "Not many of us are doing this to be driving Cadillacs. This is our heart and soul." Rogers says his heart will continue to ache over the recent suicides, and he's still rattled by the harsh letter he got. But, he concedes, the controversy did get farmers talking, and if it saves one farmer's life, he says, it will have been worth it. As the nation's dairy farmers are struggling through a fourth year of depressed milk prices, concerns are rising about the farmers being depressed themselves. The outlook for milk prices is so bleak it's heightening worries in the Northeast about farmer suicides. But as NPR's Tovia Smith reports, one recent outreach effort is drawing criticism. WILL ROGERS: That's a girl. Come on, Betty Boop. TOVIA SMITH, BYLINE: It's the crack of dawn and just below freezing. But as he does every day, Massachusetts farmer Will Rogers is outside, milking his cows. ROGERS: So these are our ladies. SMITH: His ruddy face framed by thick, gray hair, Rogers says farming is his calling, as it was his dad's. ROGERS: What I do here - this is nature's way, God's way. This is life. This sustains life. SMITH: Which makes it all the more poignant, Rogers says, that so many farmers in the current down-cycle would take their lives. The reasons for any suicide can be complicated, of course. But in Rogers' co-op alone, out of a thousand farmers, three killed themselves in the past three years. It's a very small sample but a very sharp increase. ROGERS: Tough to keep your head up with all of what's going on. SMITH: And stress is only mounting as a global oversupply of milk and lower prices overseas press milk prices further down below farmers' breakeven point. ROGERS: I don't see any relief in sight. You know, that's hard. SMITH: Knowing farmers' despair, Rogers' dairy co-op wanted to help. Agri-Mark, as the co-op's called, pays its farmers for their milk, which goes into its own brands of Cabot and McCadam cheeses, as well as others. When it came time to mail farmers their milk checks this month, Agri-Mark included a copy of the dismal market forecast and a list of suicide hotlines. ROGERS: I personally just felt my heart sink. And it just creates a lot of distress. SMITH: Especially since Rogers' own father took his life 30 years ago during another down cycle for farmers. ROGERS: Released a lot of emotion that took me years to deal with, you know, everything coming flooding right back to me. SMITH: The letter may have been well-intentioned, Rogers says, but it was so brusque and so grim without even a shred of hope to hang on, he worries it may actually backfire and drive some farmers over the edge. Agri-Mark concedes the letter was blunt. But board member Blake Gendebien says it was meant to get farmers' attention fast. BLAKE GENDEBIEN: We knew there was no great way to do it, and we decided that a letter with the check would be the best because everybody opens a letter with their milk check. SMITH: According to the CDC, farmers have a much higher suicide rate than other occupations partly due to a kind of perfect storm of financial pressure and a sense of powerlessness in an industry where prices are set by the government. Plus, Gendebien says, many farmers also feel the weight of legacy. GENDEBIEN: They're feeling, my grandfather was able to be successful. My father was able to be successful. And look at me, I can't do it. It's too much to bear. SMITH: Agri-Mark says it'll soon offer free counseling to farmers and will continue suicide prevention efforts. Dan Reidenberg, head of the National Council for Suicide Prevention, says as disturbing as it may be, talking about it as Agri-Mark did does help more than it hurts. DAN REIDENBERG: I'm not saying that their approach - being very direct - was the best approach or worded exactly the right way. But the idea that they wanted to do the right thing and try to save people - literally save their lives - is actually a remarkable effort. ROGERS: Charlie, you be good. SMITH: Will Rogers says he's not sure how much longer he'll be able to keep his farm going. To stay afloat, he's now selling firewood and some beef. There's so much more at stake than just individual farmers, he says. It's the survival of New England's landscape and character. ROGERS: You know, this isn't just a job. This is your way of life. This is your life. This is what you're put on the planet for, you know? This is our heart and soul. SMITH: Hearts will continue to ache over the recent suicides. But Rogers concedes as harsh as that letter was, it did get farmers talking. And if that saves a life, it'll have been worth it. Tovia Smith, NPR News. Transcript provided by NPR, Copyright NPR.